Big Red Ornament | Pony Ornaments Figurines | One Price Low Flat Shipping! From the Trail of Painted Ponies Holiday 2005 Collection, Big Red. Made of hand-painted resin. Measures 2.5" tall. Has cord attached for hanging. Brand new in box. 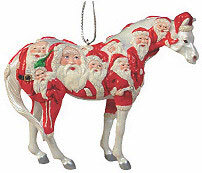 This cheerful holiday horse ornament is adorned with jovial glittering Santa Claus faces all over.